The painted ceramic cylinders made by the Maya during the Late Classic (A.D.700-900) form a special category highly appreciated by archaeologists, art historians, artists and connoisseurs alike. Many of these polychrome masterpieces have been excavated intact from the tombs and palaces of the elite, and are recognized as among the finest expressions of Maya artistic genius. Indeed, their presence is often an indicator of Classic “Maya-ness” (Reents Budet 1994) Their function and significance have been topics of debate, and the meaning of the painted scenes has been the subject of widely divergent arguments. In this paper, I examine the fascinating anomaly of the subcategory known as Chamá polychrome ceramics, equally admired but rather more enigmatic. Chamá Polychromes are named for the type site in southern Guatemala, which lies in a fertile valley in the Alta Verapáz, Guatemala’s hilly middle country, situated between the great Classic Era cities of the Petén in the Lowlands, and the more sparsely populated highlands to the west and south (figure 1). The region lies on one of the major Precolumbian trade routes, but is peripheral to the prominent lowland Maya cities, and its architectural remains are not spectacular. That, and the political unrest of the past twenty years have contributed to the long archaeological hiatus in the region. Thus pottery, always a significant element of the material record in any archaeological investigation of Maya civilization, is of paramount importance when attempting to understand cultural development and change in the geographically marginal Chamá region, where no archaeologists have worked for the past 80 years. Such vessels are almost all we have from which to infer a history of the region and to open avenues of inquiry into questions of trade, politics, craft specialization, and iconography. Where hieroglyphs are present, they are usually short phrases, personal names, or calendrical day names. Because highland ceramics used fewer and frequently more sketchily drawn glyphs than those used on the well known lowland ceramics, modern epigraphers at first believed they were merely decorative motifs, or else imitative pseudoglyphs placed there by illiterate artists. This is no longer a credible theory, although many of the inscriptions remain poorly understood. One of the reasons for the interest in these ceramics is the unorthodox sudden appearance of this sophisticated style in the equivalent of the Maya boondocks. The Chamá style emerged suddenly, flowered briefly and, with equal rapidity, ceased abruptly, as the potters turned back to their local traditions. Although generally ascribed to the Late Classic, Reents-Budet suggests an even tighter temporal frame: “Based on the scant archaeological data available for Chama-style vessels, they probably date from the late seventh or early eighth centuries A.D” (Reents Budet 1994) She estimates that no more than two or three generations of potters, working in an extremely circumscribed geographical area of Guatemala’s Hilly Middle Country, far from the great Classic centers of the Maya lowlands, were responsible for all of this pottery. There are dozens-- indeed, hundreds-- of unprovenienced Chamá-style vessels in museums and in private collections. They are burdened with the recognized problems for scholars of lack of contextual data, problematic reconstruction, creative overpainting and potential forgery. The University of Pennsylvania Museum of Archaeology and Anthropology has the only known Museum collection of Chamá polychrome cylinders with provenience: only eight vessels meet the narrow criteria of painted figural scenes, cylindrical shape, and distinctive chevron borders. Elsewhere, I have argued that the Chamá style was introduced by colonists from the lowlands (Danien 1998). Now, through an examination of the Chamá Vase from the Penn Museum collection, I can give a name to two of their rulers. The scene on the vessel (figure 3) (Click on the link and use your browser back button to return) shows two groups of figures facing each other across a kneeling figure flanked by two black painted individuals. The interwoven mat design on the arms and legs of the kneeling figure is a symbol of royalty and identifies him as a member of the elite, perhaps a ruler of a small polity, although he wears nothing to announce such an exalted position. Judging from the combination of jaguar skin cape, elaborate jewelry, and fierce expression, the black-painted man holding the spear is the most important figure in the scene. It had been generally accepted that the glyphs stood for the names of the actors, but they defied interpretation or sense in any of the highland idioms. However, in Eastern Cholan, the family of languages spoken in the Maya lowlands, they become clear. Thanks to the invaluable work of linguist Judith Storniolo of the University of Pennsylvania, a tentative interpretation of the inscription provides names for the figures, and conveys political and social information, including a previously unknown title for a religious office (Storniolo 2000: personal communication). Reading the scene from left to right, the first two figures, K’an Chubi, Yellow, or Precious Turkey, and Holtab Balam, Forehead or Headband Jaguar, have no central role in the proceedings. 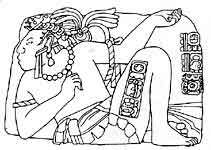 The name of the third figure is Bas Ch’am, which can be read as “Wrapper of the Harvest.” The black painted figure next to Bas Ch’am is K’an ti Pop: Lord Fer de Lance. The glyphs accompanying the kneeling figure have a more enigmatic meaning. Ch’o Tz’apah Ah Waxak Haab Sus can be understood as “Lord Puma, he who has ruled for eight years, set him or it in place, ” with the final glyph meaning blood, or purifying. The glyphs before the commanding figure of the black-painted man holding the spear are read Ochma Kab Pop Muwan....Lord Owl, or Lord Muwan, entered the earth. The final figure is K’an Moo Ch’ok Ajaw, Young Lord Yellow Macaw. This vessel has been the object of differing interpretations, with its actors identified variously as supernaturals, underworld figures, and merchants. I argue that it commemorates a real event, and carries cultural information of importance in our understanding of the time, the place and the people. The important event being commemorated is the funeral, or the entering the earth, of Lord Muwan. His heir, the young lord, is behind him, on the viewer’s right, observing the ceremonies. The phrase ch’ok ahaw, literally, young sprout, is frequently used to identify the heir apparent. 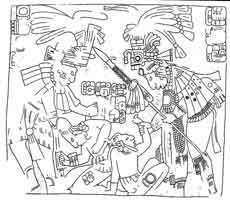 Similar scenes with both the dead king and the living heir are known from Palenque, where the dead ruler Pacal and his living successor, Chan Bahlum face each other. Among the attendants on the vase is the person who dresses the dead, Bas Ch’am, the “Wrapper of the Harvest.” Such a description of his function reinforces the argument made by Marshall Becker (1992), that interment of the dead for the Lowland Maya was not burial, but rather, an offering to the Earth Lord. K’an ti P’op, Lord Fer de Lance, is a central participant in the ceremonies surrounding this offering. The kneeling figure, Lord Puma is about to be sacrificed as part of the purification ritual in connection with Lord Muwan’s funerary ceremonies. The ‘sacrificial’ paper earrings he wears, his lack of other ornament, his position under the blade, all point to his imminent sacrifice (Schele and Miller 1986). The mat design on his thigh and arm identify him as a member of the elite class. When captives are shown on Lowland monuments, they are usually identified by their name glyphs on their bodies (figure 4a,b). The scene on the Chamá Vase, coupled with its use of a lowland language and current archaeological data from other sites, contributes to a picture of the political changes of the Late Classic in this little known region. By about A.D. 650, shifting alliances and wars among a variety of Maya independent polities were becoming more widespread and more destructive than ever. Among the mechanisms designed to avoid internal conflicts among the growing number of elite was a “hiving off,” whereby cadet groups of the ruling families would leave their native city and go off, to either found a new city, or take over a weak, existing polity. As part of the trading network that spread from highlands to lowlands, Chamá was known to those who lived in the lowland cities along the Pasión and the upper Usumacinta River regions. As the only broad valley along the Chixoy River (figure 5), it would have been attractive to such elite colonists, escaping from the political and military unrest of the lowlands. Because the inscriptions identified them, we know that the artists who painted the beautiful polychrome vessels of the Late Classic frequently were junior members of the ruling families (Reents-Budet 1996, 1998). Such artists among the colonists would have taught the craftsmen of Chamá to imitate the vessel form and painting styles common to the lowlands, and commissioned illustrations that reflected the political and religious power of the new regime. The importance of these new overlords is reflected in the many sherds of Chamá vessels found in several of the polities along the Usumacinta River. The style, despite its brief life, was sufficiently well known and appreciated to be used by Maya artists as a decorative element on several unprovenienced Chamá-style vessels! Another polychrome cylinder hints at the city from which these colonists may have come. The Altár de Sacrificios Vase, from excavations at that site, has been interpreted as commemorating the funeral of the personage in whose tomb the vase was found (Adams 1971). Three of the figures on the vase are identified as elites from three different sites. Two of those sites are in the Lowlands, and one is still unidentified. The glyphs that identify the seated man with a deer headdress state that he is the way or spiritual co-essence of the bacab or ruler of a site, whose emblem glyph is still unrecognized (Adams 1977). The suggestion has been made by Reents Budet and Sharer, among others, that the site from which he comes is in the highlands. Given the relatively large quantity of Chamá vessels at Altár, one can assume trade and elite gifting relationships with highland polities. If the colonizing group that took over Chamá came from this region, then their presence at an important funeral would be appropriate, and the naming of the Chamá ruler as a bacab, or ruler of a secondary site, perhaps with obligations to the ruler of Altár, would be completely understandable within the Maya political structure. Altár de Sacrificios is at the juncture of the Pasión and Chixoy rivers, downstream from Chamá, at the point where the two rivers join to form the all important Usumacinta River. Thus, the Chamá Vase fills in a small piece of Late Classic Maya history: The lowland intruders into Chamá introduced an art style and ceremonies that were emulated for as long as the colonists were perceived as powerful. Lord Muwan was succeeded by his son, Young Lord Yellow Macaw. 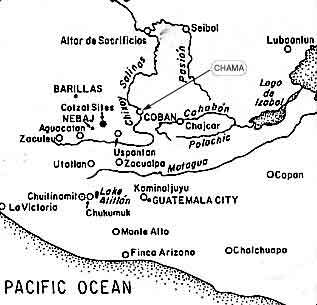 With the collapse of the great cities of the central Petén, the wealth of the lowlands ceased to find its way into the highlands. The colonizers were no longer considered as valuable and worthy of imitation. They left, or were absorbed into the local culture. As the older artists died, the new ones took on the styles of the surrounding community. The potters reverted to the old ways, the brief florescence of Chama polychrome cylinders ended. For the last time, Lord Muwan and his dynasty entered the earth. 1998 Elite Maya Pottery and Artisans as Social Indicators. In Craft and Social Identity, eds. Cathy Costin and Rita Wright, Anthropological Papers of the American Anthropological Association No. 8, Washington, D.C.